Comella, Rosemary; Kratky, Andreas. — Norman M. Klein: bleeding through: layers of Los Angeles 1920-1986. — Los Angeles: Annenberg Center for Communication, University of Southern California; Karlsruhe: ZKM/Zentrum für Kunst und Medientechnologie Karlsruhe, 2003. — N. p. — Box set including a book and a DVD-ROM. — ISBN 3775712801. 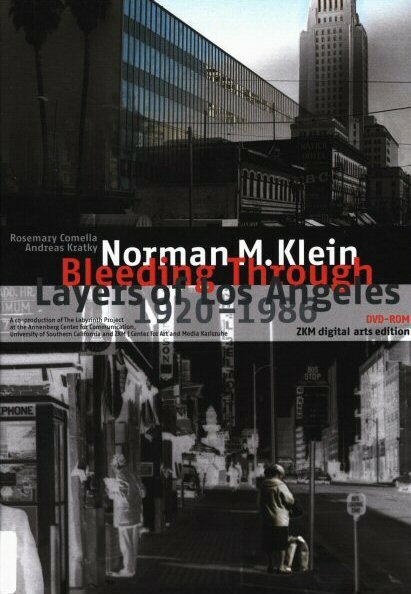 Bleeding Through: Layers of Los Angeles is a joint production by historian Norman M. Klein, theorist Marsha Kinder, and artists Rosemary Comella and Andreas Kratky, who designed the DVD-ROM’s interface. The constant thread throughout the project is the day-to-day life of Molly, a citizen of Los Angeles who bears witness to the socio-political phenomena that have shaped the city’s urban landscape since the start of the 20th century. Molly’s biographical journey revolves around a collection of documents that includes photographic prints, film clips, press clippings and maps. The DVD-ROM is accompanied by a novella published as a booklet in which Klein further develops the project’s narrative. By blending an ethnographic approach and a fictional narrative, the two components complement each other: the DVD-ROM reveals the documentary infrastructure behind the novella, which in turn present the traces left by a singular existence in historical time. The DVD-ROM’s interface (c) offers an overview of the content through chapter headings presented on a vertical axis as in a menu or a table of contents. By selecting a heading from this interface, users display a horizontal scrollbar of images they can shift through by moving their cursor right or left. At the top and bottom of the screen, two caches adjust the various sizes of documents to the dimensions of the scrollbar. The selected segment sometimes displays as a single document accompanied by a legend or comprises a series of photos, film clips and QuickTime VR panoramas. An intriguing soundscape of urban noise is added to any images without a built-in audio track. A high-speed navigation tool allows users to display, thanks to a smaller scrollbar, the entire selection of images available under the heading and to select an image using a viewfinder. Users can also consult a directory listing the source (libraries, archive centres, private collections) of the digitized documents. Although numbered, the DVD’s sections and headings don’t follow Molly’s biographical timeline but instead reveal a method of writing using layers whereby the initial steps (research, story plan) take precedence over consolidating the narrative. Part 1, “The Phantom of a Novel: Seven Moments,” isolates key moments in an interview that Molly supposedly gave Klein in 1986 as he prepared to write a novel or script. A video window on the right of the screen displays Klein as the narrator. Users can deactivate this window if they wish to move through the scrollbar of images without narration. The photos from public and private archives that accompany Klein’s monologue evoke people and places in Los Angeles that have marked Molly’s life. Some of the photos are linked to recent images of the same site superimposed in a cross-fade. Users can control the movement from past to present and vice versa. Excerpts from vintage films spotlight the urbanity pervading cinema’s portray of Los Angeles between 1920 and 1970. Infused with their own rhetoric, the documentaries and newsreels report on historical events in the first part of the 20th century (the Depression, Prohibition, the great wave of immigration) that had repercussions on the city’s population and landscape. In Part 2, “The Writer’s Backstory,” Klein fills the gaps in Molly’s story by focusing on overlooked characters and anecdotes and clarifying his method of gathering documentation. With a sampling of press clippings, the author underlines the links between Molly’s misadventures and various crimes that made the headlines in the thirties and forties. Part 3, “Digging Behind the Story and Its Locale,” delves into documentation collections, gathered by Klein and his collaborators, which nurtured the project without being incorporated directly into it. This part includes a set of interviews with people who lived through the historical period that Molly’s story spans, a section on Bunker Hill, the decimated neighbourhood where Molly resided in the fifties, as well as video segments reproducing the camera movements from famous movie murder scenes shot in Los Angeles. Klein also evokes major events in the city’s history that Molly has overlooked because they were ignored by the media. One section provides samples of maps of Los Angeles between 1920 and 1986. Finally, Klein again underlines the project’s deliberate incompleteness and the vulnerability of storage mediums by describing the consequences of a power failure on the content of the DVD-ROM, which was to include other interactive components that ended up being erased from the computer’s hard disk.